Go, Tracy, Go! : Should liability trump personal responsibility? Should liability trump personal responsibility? As some of you may know, many Chicago-area races (is this national?) 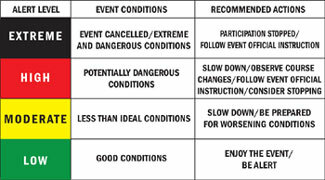 use a color-coded "event alert system" to warn participants of the weather. To the best of my knowledge, this started with the 2007 Chicago Marathon, aka The Year The Marathon Got Canceled Partway Through. I was volunteering at the 5m elite water table that year, and it was hot out. Once the elites had passed by, we went to the 10k water station and tried to help. They weren't short of water, nor volunteers, but they were short of cups. They couldn't get the cups filled fast enough and the desperate runners were taking several at a time. The whole time, from a few minutes after the race started until we left the finish area hours later, we heard sirens going off. We saw a man collapse and two runner/doctors stopped to help him. "Our race is over, anyway," they said, even though they'd traveled in from Tennessee to run this race. My sister was leading the 4-hour group, but she didn't cross the line on time because they made her walk, which gave us a several hour scare waiting for her while not knowing what was going on. And while listening to the sirens. Like I mentioned the other day, the Soldier Field 10m run was changed to black around the 2-hour mark of the race. When I heard the announcer say that (after I'd finished, thankfully), I kind of thought it was a joke. He was saying, "When you turn on to Soldier Field, please walk the finish. The race threat level is black." The last 50m of a race? You're supposed to walk? On the actual field where the Bears play? I understand why a race would want to protect itself against runners hurting themselves. But if this trend of races being canceled (Chicago Marathon, Soldier Field 10m, Myrtle Beach) or re-routed (Nashville) continues, it's at odds with the trend of pricier and pricier "destination" races. The 2011 NYC Half Marathon will cost you $104 to enter. Add plane tickets and a Manhattan hotel and you've easily spent at least $750 to run a half marathon. This trend also - to me - seems to play into the undertrained, novice runner. I'm not knocking novice runners; everyone has a first-time, and let me tell you, most of those novices are faster than I am. However, if you've trained for a race - really and truly put the time and miles in - you should have some idea of what it means to run in heat or rain or snow or "extreme" conditions. Shouldn't you be able to decide for yourself if you'd like to continue the race? We've all met those people at the start line of a marathon whose longest training run was 10m, or who didn't really do any running, per se, but who swear they're totally talented cyclists. And then we've all seen those people either drop out or stagger to the finish, unhappy and hurt and vowing never to run again. While I agree that you *should* be able to decide for yourself whether to continue, the sad reality is that there will be people who decide to continue, get heatstroke, and then sue the marathon organizers. I think it's more a reflection of our lawsuit-happy culture than anything else. That said, I think the cancellation of races due to weather is focused on the novice runner, but it's a recognition that the novice probably doesn't have a coach to turn to for advice. Since the undertrained runner dragging himself across the miles for hours after the elites have crossed the finish line (as the temperature just keeps going up) doesn't have a trusted guide to tell him to slow down or stop entirely, the race organizers step in. It's not just Chicago, by the way. When I did the Disneyland Half in 2007, they informed us that we were in "red flag" conditions, and if it got any hotter, they would go to "black flag" and the race would be canceled. When did "skirt chasing" become funny? The hardest thing I've ever done in my life. How did I spend a race-free weekend?